5th Call: Registration for the 2nd Info Day (7/2/2019) is now open! 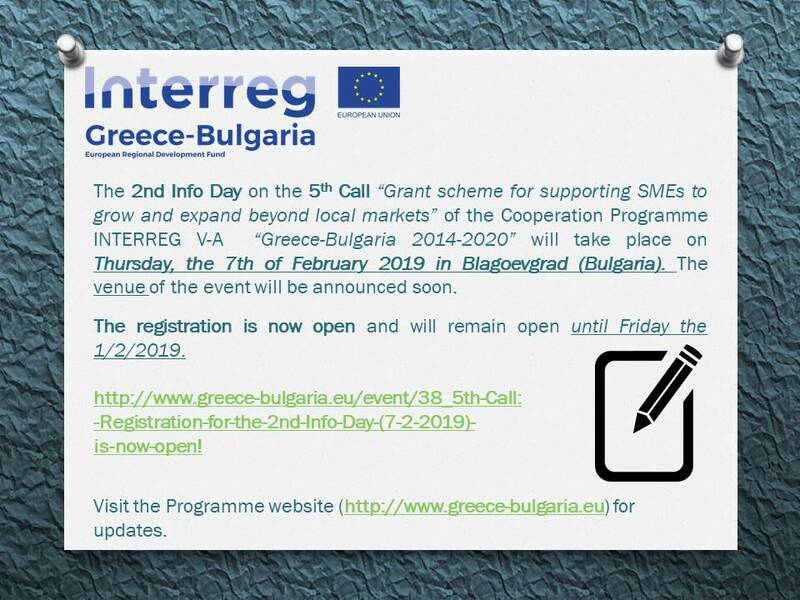 The Managing Authority of European Territorial Cooperation Programmes, the Bulgarian National Authority and the Joint Secretariat of the INTERREG V-A "Greece-Bulgaria 2014-2020" Cooperation Programme, are organizing the 2nd Info Day on the 5th Call for Project Proposals “Grant scheme for supporting SMEs to grow and expand beyond local markets”, under Priority Axis 1: “A Competitive and Innovative Cross-Border Area”. Find here the draft agenda of the event. Pre-event registration is obligatory by filling in the online form given below. The registration is now open and will remain open until Wednesday 6/2/2019 (new date). Interpretation in English, Greek and Bulgarian will be provided in all Info Days. In addition, attendees will have the opportunity to interact through B2B meetings that will be organized in the framework of the event. In case you are interested to attend such a meeting, please declare it in the field “Do you have general questions/ comments?” of the registration form. Visit the Programme website regularly for updates and/or possible rearrangements. Read here for more upcoming events regarding the 5th Call.